A sink has tons of uses, but if you plug up the drain in your sink the opportunities are endless! Stainless steel sink stoppers can help with just that. Just place it in your sink drain and you're good to go! The days of frustration when cleaning are over! These things are extremely durable so you don't have to worry about replacing it over and over. Not to mention how incredibly simple it is to use. Replacement stoppers can be worrisome to change out so we made sure we did our best to make the experience easier for you. You may notice that your sink has more uses. This is a generic product designed and engineered in the United States by Think Crucial. This is not a InSinkErator OEM product and is not covered under any InSinkErator manufacturer's warranty. The InSinkErator brand names and logos are the registered trademarks of their respective owners. Any use of the InSinkErator brand name or model designation for this product is made solely for purposes of demonstrating compatibility. EXTREMELY DURABLE so when you insert your new stainless steel sink stopper with rubber gasket into your InSinkErator Garbage Disposal it doesn't break or cause you to purchase anything extra. Just go back to using your sink! RUBBER GASKET DESIGN so that nothing can slip through the cracks and into your garbage disposal. With this rubber edging you can be sure you'll stop everything from falling down your drain! SIMPLE TO USE because it is easy to install. 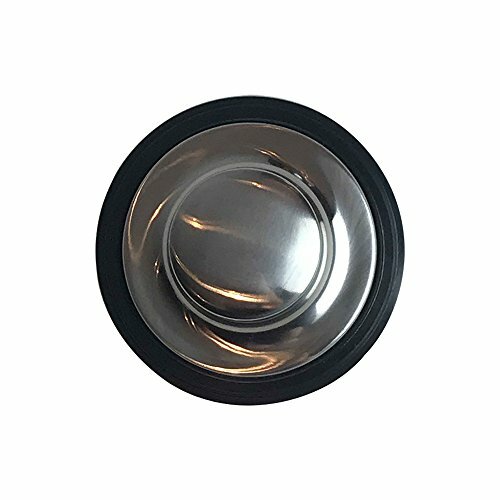 This stainless steel sink stopper with rubber gasket is the same as part # STP-SS so you'l have no issues installing it...and by installing it we mean just placing it in your sink! INCREDIBLY STRONG because you don't want to have a sink stopper that is weak! This stainless steel sink stopper with rubber gasket is incredibly strong so you can keep anything you want from falling into your garbage disposal! If you have any questions about this product by Think Crucial, contact us by completing and submitting the form below. If you are looking for a specif part number, please include it with your message.